as distance/time to Home Geofence and Other GeoFence, so named as Unique name of Geofence in device properties. - Remove pyicloud unused modules. - Remove module six dependency by above. - Add action group to allow change in interval checking. - Fix bug for GetData via action and plugin Menu. 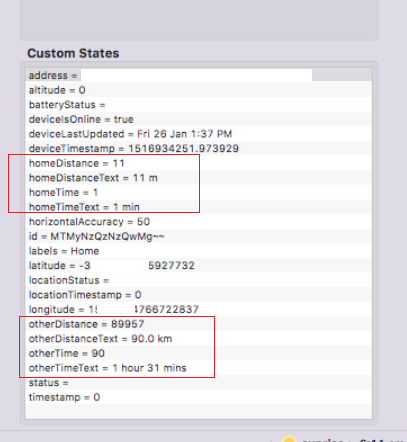 add Events/Triggers for GeoFence Arrive and GeoFence Leave; selectable by GeoFence and iFriend Device. 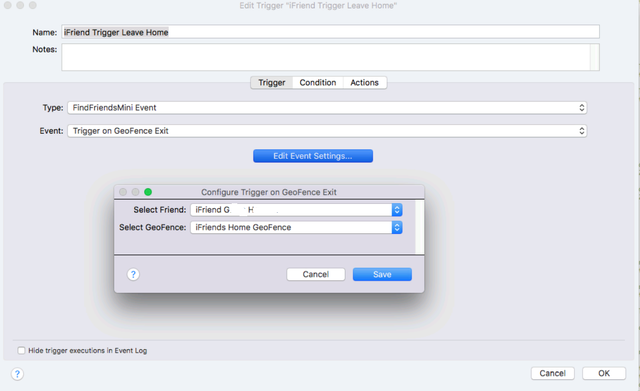 - Create trigger/Event which is selectable within Indigo by Friend and Geofence. - Two selectable, either exit GeoFence or Enter Geofence. When any change at standard interval update will trigger this event/action. Keen to look at historical location tracking - but would prefer to do so with online service. Needs a Google API Key enabled for Static Maps and Distance Matrix. Free from Google. See website for details. - Create very small separate FFM-GeoFence log file for data collection of these accuracy ratio/settings - in normal log file directory. (Happy to finetune ratio if more data seems to suggest makes sense) and this logfile will help if any issues. Currently set at a ratio of 2 - seems to be ideal spot. - Adds ZachBenz fix for 'followers versus following' -- Thanks! Code was using followers, but should have used those we were following. See github issue #16 for those interested and lost! - Bugfix if icloud debugging enabled - deleted unused pyicloud routines, and dependencies but left one debugging line in. Last edited by GlennNZ on Thu Feb 08, 2018 6:19 pm, edited 1 time in total. Further Geofence accuracy management updates. Believe finetunes everything well. Will only trigger if device is Online (if device becomes offline will not trigger). Uses accuracy combined with size of geofence range to decide whether should exit/enter - working well in my testing. Deal with device becoming offline avoiding a trigger Geofence Exit/Entry whilst offline e.g. Server down for 10 minutes; device no longer with Geofence. Exit triggered. Fixed.